New Senate candidate in South Carolina race? 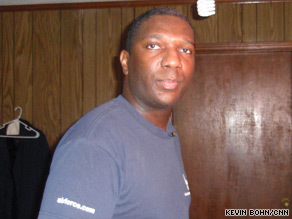 South Carolina Democratic Senate nominee Alvin Greene is unlikely to defeat Republican Jim DeMint in November. (CNN) - Jim DeMint and Alvin Greene have some company. A high school social studies teacher from Greenville, South Carolina will launch a write-in campaign for U.S. Senate this week, CNN has learned. The goal, said the teacher, Greg Snoad, is to offer Republicans, Democrats and independents "a chance to make a symbolic vote for civil political discussion." Snoad, who is active in Democratic politics, told CNN that Greene's unexpected victory in June's Democratic primary made the outcome of the Senate race all but certain. Greene, a political neophyte who was indicted in August on obscenity charges, stands almost no chance of defeating DeMint, his Republican opponent, in November. "The way the race has worked out, I think a lot of people are looking for an alternative to the kind of political discourse we have now," Snoad said. "I think this race provides us with an opportunity to give people a chance to cast a vote for that kind of symbolism that maybe another race that's more competitive wouldn't have provided." Snoad said he has no illusions about unseating DeMint and called his effort "a purely symbolic campaign" that will be conducted almost entirely using social media sites like Facebook and Twitter. "I would not do this in a race where I could affect the outcome, because I am not running to win the office," he said. Snoad is not the first write-in candidate in the race; Mazie Ferguson, an attorney from Sumter, announced a bid last month. Tom Clements is running as the Green Party nominee. No mention of Tom Clements, the Green Party candidate? This Alvin Greene is obviously a plant. I don't know how he could have won the primary. Investigate this further! The Real Issue my South Carolina citizens is the fact that some or most of you on the Democratic side do not understand the meaning of being serious with your candidates. To allow a candidate such as Greene to represent your party in a U.S. Senatorial election is an embarrassment to your citizenry. Everybody is jumping on the bandwagon to trash Alvin Greene but they don't say much about Obama.Obama needs to go stand in a corner of the oval office of the W.H.with a "dunce" cap firmly planted on his head. Yes, anyone who has a genuine goal should run INSTEAD of GREENE – PERIOD! My POINT and my CASE! Vote early, vote often. Vote Greene. Greene for Prez in 2012. I've known Greg Snoad for over 15 years now and I can honestly say he's an extraordinary person with the ability to host intelligent, balanced discussions to help produce workable practical solutions for the problems people face in society. I couldn't think of a better person to run for this seat. I hope people take a good hard look at what he's offering and decide for themselves. Even though he is on the democratic side, i don't believe he will do a good job representing the democrats especially since he has a background of charges and he's possibly better than other people but he's still corrupt. There's no way he wil be able to represent the people well.